Adware-type programs may appear as harmless, but they can cause you serious problems if you do not remove them in time. ShopperSaga looks like an exciting program that promises discounts for various products, but in fact, it is just a mere adware set to show you intrusive third-party advertisements whose legitimacy cannot be verified. As a result, you do not know whether the promoted content is legitimate and can easily get your computer infected with more malware, provided that the content is of malicious nature. Therefore, in this article, we will provide you with the most relevant information about this application including its origins, distribution channels, functions, and more. Let us begin with this application’s origins. We have found that ShopperSaga was published by a company called MDMExclusives/MyDailyMoment which is a trademark of Flatiron Media, LLC. We are fairly familiar with this company because we have analyzed dozens of its programs. As far as we know, this type of adware program is this company’s only product, but make no mistake, ShopperSaga has many clones that include names such as BabyBrowse, SlateBeauty, and Travel Giga. All of these applications function in a similar manner and their distribution methods are, for the most part, the same. So, unsurprisingly, this adware comes from a shady company that specializes in web monetization via ad-supported programs, now let us see how this new program is disseminated. While doing our research, we have found that this application is being advertised using other malware that includes adware and browser hijackers. We have found that browser hijackers include links to this program’s main distribution website at Shoppersaga.com in their search results. The hijackers that promote it may include Search.youremailhub.com, Search.ozipcompression.com, Planet-surf.com, and so on. Also, adware also links to the same website mentioned above. So it seems that this program’s main distribution channel is Shoppersaga.com. Nevertheless, we have received information claiming that Flatiron Media’s adware is being bundled with other applications and hosted on questionable freeware distributing websites. However, we cannot confirm this information, but we advise that you always opt for custom or advanced installation settings to reveal additional software installation choices. Furthermore, we would like to warn you that this adware’s installer featured on its main website is of the InstallCore type. This is significant because this particular installer bundled with shady software by default. The list of applications this installer may come with includes FLV Player, MyPcBackUp, Foxtab PDF Converter, and System Healer. Take note that all of these programs fall into the category of potentially unwanted because they are next to useless. Now, let us move on to ShopperSaga’ functionality. 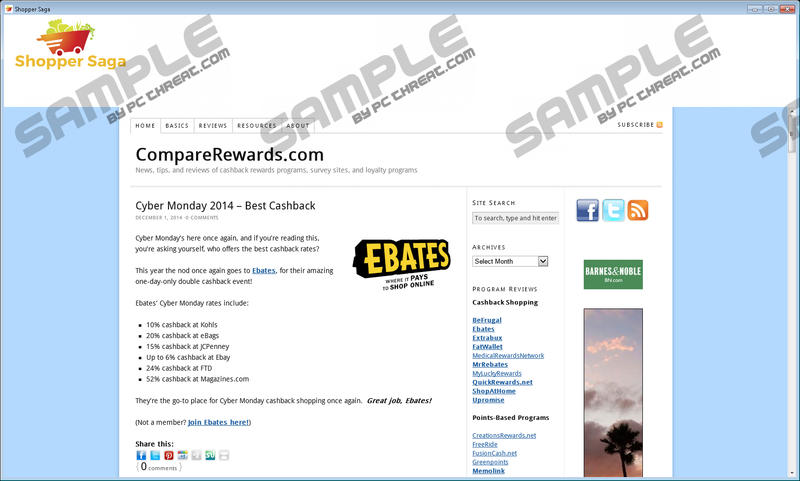 When you install this program, it will create a desktop shortcut that when clicked will open an advertising window and load http://comparerewards.com, a website that is supposed to give you various discounts at different stores. In addition to this browser-based advertising window, this application will also open Internet Explorer that will load different advertisements that include http://s3.amazonaws.com/dm.leadgen/page/index.html, http://redtag-specials.com/?agent_ID=201735&campaign_ID=6089, http://www.electronics-sweepstakes.com/Flow.aspx, and many other promoted websites. Given the unreliability of the developer, we believe that this application can promote malicious software or scam websites set to extort money from you. Nevertheless, in some cases, the application might open the advertising window and the browser automatically which is very annoying and intrusive. In any case, it is clear that ShopperSaga is no good. It was published by a known malware developer that is in the web monetization business and is associated with various shady websites. Moreover, this application is promoted using other malware and comes bundled with PUPs. Lastly, it is used to collect information used for tailoring advertisements and increasing the advertising revenue. So if you want to remove this adware, then follow the instructions provided that the bottom. Identify and highlight the adware. Press Windows Key+R on your keyboard. Identify and highlight the application. Press Windows+X keys and open Programs and Features. Identify and highlight the program. Right-click on it and Uninstall it. Quick & tested solution for ShopperSaga removal.